England expects that every man (and woman) will have a good story to tell! Britain’s Royal Navy has been an effective fighting force for well over 200 years, and still “punches above its weight” in international engagements, the most recent example of which has been the multinational effort to eradicate the activities of Somali pirates in the Indian Ocean. Relentless cheerfulness, which we might translate as optimism. He notes that the optimism starts with the captain and flows downward through the ranks. The evidence is not hard to spot: Happy ships fulfill their roles more effectively than gloomy ships. Institutional memory is better preserved. Each team member can stand up at a moment’s notice and describe his or her role in fulfilling the mission. Can each member of your team do that clearly and concisely? The last point is important: Given two equally talented groups of people competing for the same pool of customers, the more engaged and motivated group will win 90% of the time. 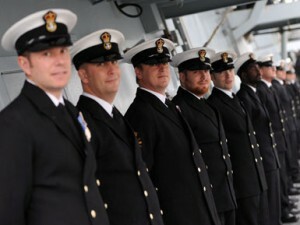 This was a fun article that taught us a lot about the British Navy (told a great story, in other words) and as a result more memorably communicated it primary thesis about the high value of the personal connections that drive transformational leadership. What do you think? Is the example of the Royal Navy a useful one to apply to non-military environments? Let us know your perspective in the comments section.